The presence of fresh water differentiates the Earth from all of the other planets around the Sun. Water represents life. Whether you like to or not, the Earth is in dire shape ecologically and the gross fresh water and clean water crisis as well as the global warming crisis are clear signs that we are headed for disaster unless we make a collective effort to rectify the root issues. While each of these issues is seemingly distinct from the other, they are actually related in more ways than one. This comparison article takes a look at some of the more distinctive characteristics of each as well as the key points wherein they juxtapose. Water crisis refers to the scarcity of the world’s water resources with regard to human demand. While the phenomenon is readily acknowledged by organizations such as the United Nations, other organizations aren't quite so eager to accept its inevitability. The global warming crisis for its part, refers to the rise in the average temperature of Earth's air, a phenomenon that began in the mid-20th century and is expected to continue into the distant future. This is typically blamed on widespread deforestation, the burning of fossil fuels, industrial pollution, destructive industrial practices and policies which are driven by ever growing consumer demand and stock market demand among other things. The water crisis may manifest itself in different ways, some of which are occurring already. Some of the more significant global signs of the crisis are inadequate drinking water for many millions of people, lack of sanitation and waste disposal water in many countries, over drafting or overuse of groundwater, corporate ownership or privatization of most fresh water sources and possible conflicts that may arise from territorial disputes. The crisis is also expected to result in a rise in cases of waterborne diseases worldwide. As for the global warming crisis, this is clearly seen in the increase in the average air and ocean temperatures worldwide, which is accompanied by the widespread melting of snow and ice. This last factor is also expected to cause a rise in the average sea level, with the combined effects resulting in the loss of millions of acres of farmlands and coastal lands. Much of the efforts to solve or at least reduce the effects of the impending water crisis revolve around water treatment and desalination of seawater, although the associated technologies are still quite costly and difficult to implement. As for the global warming crisis, most of the efforts made towards reducing greenhouse gas emissions have been implemented by way of developing and using more environmentally friendly technologies, as well as the use of alternative fuel sources. In both cases, the solutions in use today are not adequate largely due to market forces which are resistant to changing the status quo. A new way of thinking is critical and must pick up momentum if our children are to have any chance of a productive future. The best motivation to take corrective steps was touted by Prince Charles himself when he emphatically stated that our grandchildren must be provided with a meaningful life on the Earth. 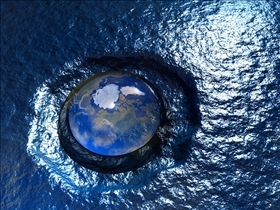 The presence of fresh water differentiates the Earth from all of the other planets around the Sun. Water represents life. Technological innovation is promoted as the only chance for survival as people are unwilling to give up lifestyles which are unhealthy for the Earth and her people. Which crisis will affect everyone sooner?